To Skill and Drill or Not? I am a strong advocate for personalised learning and thus promote ways for students to engage in real world problem solving and experiences. Developing and designing curriculum that promotes students to connect with each other and the world is a passion. I guess that because I speak of these things and promote these ideas, people can often assume it is the only way students learn in my class, but this is not the case. I was recently asked how kids can possibly learn if we don’t provide them skill and drill opportunities. I have in the past expressed concern with students being forced to complete monotonous handwriting and timetables drills. That is not to say that I don’t see value in students practicing skills to master or develop sound strategies. A musician certainly does not improve if they do not spend hours rehearsing their execution. A writer does not develop their craft if they do not practice writing. An athlete needs to practice technique, rehearse strategy and build fitness through regular training. An artist doesn’t pick up a paintbrush and create a masterpiece without time to develop technique. I will use a personal example, as I played basketball for many years. If all I did was layups, Cincinatti, 3 man weaves and Tennessee drills for an hour and a half twice a week for practice I probably would have lasted a month. I would have lost all interest in a sport which had potential to have a huge impact on my life. Of course that was not the case and by providing authentic opportunities in practice through scrimmages (game like matches) and then of course playing an actual match against real opposition on a weekly basis meant I valued the practice as ways to improve. I saw that by practising my shooting, dribbling and fitness outside of training I would increase my chances of success in the real match. I knew there was definite purpose in doing these things. 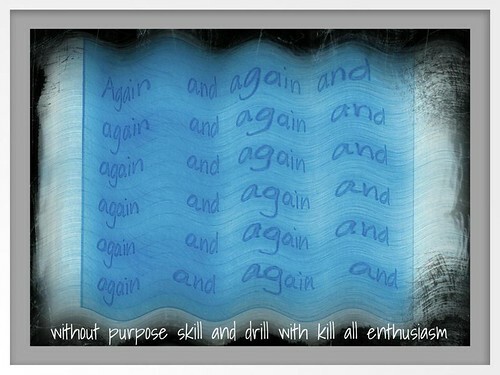 So for sure, students need to develop skills, strategies and processes to develop their understanding and abilities, but if your classroom is all skill and drill and no scrimmage or game, your students will quit the game of learning. Our students need to see the purpose of developing their skills because there is an authentic reason to do so. If you’re teaching letter writing form, then be sure your students get an opportunity to write to a real person of interest; an author, a pop-star whomever they choose. If you’re developing argumentative or persuasive writing, be sure your kids have a real cause and can use their skills by giving them a platform and an audience. Write to your local politician, the Prime Minister, the UN! If you are developing procedural skills, be sure you give kids the opportunity to put it into practice. Record a “how to” for YouTube, be sure that they get feedback on whether the instructions were clear because “real” people followed their instructions. There are so many examples of people doing great things with kids to ensure they get these opportunities. I get (steal) loads of examples and ideas from the amazing twitter PLC, great colleagues, friends and my YouTube subscriptions!